Large 6 bedroom / 6 bath mountain home on golf course, ideal for large family get-togethers or extended family stays spent at the foot of the Tetons. Treat yourself, family, and friends to a grand escape in Jackson Hole with a stay at the remarkable Sage Estate. This home was truly built for getting the whole family together. The Sage Estate hosts six bedrooms and six and a half bathrooms with additional living space, including a kids’ adventure loft and office space. The property boasts 5,000 square feet of custom flooring, granite counter tops, and an eloquently-executed design aimed to tie together the western atmosphere of Jackson Hole with an abundance of elegant comforts. The Sage Estate is located on the Jackson Hole Golf & Tennis Estates and is in close proximity to Grand Teton National Park and the historic town Jackson, granting its visitors convenient proximity to the beautiful wonders of Jackson Hole. The Sage Estate has a remarkably special character given its size and taste as well as its location in one of the most stunning regions in the West. If you’ve visited Jackson Hole before, there’s a reason why you’re coming back. If this is your first time to our special part of the world, you may never want to leave. Jackson Hole is a place where some of the most unforgettable memories are made and adventures of a lifetime are to be had. Enjoying your holiday with a stay at a property like the Sage Estate only magnifies the experience. Wake up to a view of the Tetons from your bed, enjoy the company of your family and friends over freshly brewed coffee and a breakfast spread at the large wood dining table before hitting the alpine terrain for a gorgeous hike or mountain biking ride. During your day out in the national parks or surrounding natural areas you are more than likely to see a critter or two, of all sizes. Deer and moose even sometimes come take an afternoon nap on the lawn at Sage Estates itself. After a day skiing some of the best slopes in the West during the wintertime, grab a blanket, a loved one, a hot cup of cocoa and or a book, and cozy up to the grand fireplace while watching the falling snow through the large windows encasing the living area. This property was built for creating memories with loved ones and any trip to Jackson Hole should be one to be remembered. Savor these moments and treat yourself, family, and friends to a beautiful holiday with a stay at the Sage Estate. After you make your way down the beautifully-landscaped driveway and pull up to the front door of Sage Estate, you will enter the home through the foyer. To the right of the foyer is the large master bedroom and bathroom. To the left of the foyer are the guest bedrooms and en-suite bathrooms, office, additional living space and the kids adventure loft. When you continue past the guest and master bedroom corridors you will enter a spacious living room with tall ceilings and an open-concept dining area attached to the kitchen. Guest Bedrooms and Bathrooms - Down the guest corridor on the right- and left-hand sides of the hallway are the large guest bedrooms. All bedrooms feature beautifully-selected decor, fine furnishings and comfortable mattresses. Each bedroom has an en-suite bathroom featuring a shower/bathtub combination, toilet and sink. Master Suite and Master Bathroom - The master suite is located in its own corridor. This beautiful room offers a gorgeous hand-crafted king bed. The bed is topped with a luxurious down comforter and extra pillows. This bright room features large windows, highlighting the beautiful colors of the wood furniture throughout this room. Nightstands rest on both sides of the bed and an armoire and a writing desk complete the furnishings in the master bedroom. The master bathroom offers a deep-jetted tub, walk-in shower and double vanity. This master suite has a single entrance as well as private access to the wrap-around deck. Office / Bedroom / Kids Adventure Loft - This dynamic room is located at the end of the guest corridor. Watch a movie on the entertainment center, crack open a book and relax on one of the couches, or let the kids play in the loft with the Legos and toys provided. In addition, the outdoor patio can be accessed from this room and with floor to ceiling windows, the room is flooded in natural light and the essence of the landscape is allowed inside. Kitchen and Dining - This fully stocked, open-concept kitchen has been remodeled with gorgeous granite counter tops, a walk-in pantry, and high-end appliances. Whether you’re hosting dinner or hiring a private chef, this kitchen was certainly made to entertain. Large windows flood the dining area with natural light, complementing the open concept of the kitchen and dining area. The kitchen flows into the split living room via a massive and stunning wooden table with seating for 16 guests. Living Room - This beautifully appointed living room hosts elegant amenities and comforts with ample seating, perfect for reveling in the days' adventures spent around Jackson Hole. Cozy up next to the noble fireplace on those cold winter days and nostalgic summer evenings. Large, picturesque windows bring in an abundance of natural light, highlighting the beauty of this room’s woodwork, artwork and tasteful furnishings. Plush seating, elegant decor and a big screen TV create a lovely living room space perfect for unwinding with loved ones. 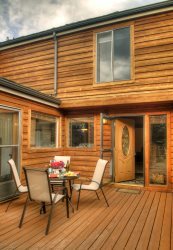 Deck and Outdoor Space - Marvel at the stars and soak up the area’s natural beauty from the comfort of the eight-person hot tub while surrounded by crisp mountain air, vibrant green pine, rustling aspens and abundant wildflowers. In the summer, enjoy the abundant deck space and admire the beautiful surroundings while grilling on the BBQ with family and friends. Wildlife is a common sight at the Sage Estate and visitors may often come enjoy a nap in the lawn or chirp a song from the trees. En-suite Guest Bathroom - This full en-suite bathroom offers a shower/bathtub combo, toilet and sink. Laundry Room - Equipped with a washer and dryer, located just off of the foyer. Powder Room - Half-bath conveniently located near the common area. Jackson Lodging provides some essential items that one may need for their stay. We place linens and terry in the unit, which are washed with Green Seal-certified detergents. Toiletries (shampoo, conditioner, lotion, mouthwash, grooming kit, toilet paper, Kleenex), dish soap, sponges, trash bags, etc., are provided for your use at no additional charge. Kitchen amenities, other than coffee filters, are not provided. There may be items such as spices, ketchup, salt and cooking oil at the property that have been left from previous guests. This cabin is cleaned with Green Seal-certified products for your health and the environment. My family and I thoroughly enjoyed this magnificent home. The setting and views are magnificent, and the accommodations enviable. While it's a 15 minute drive to town, or 30 minutes to Teton Village, the scenery is so magnificent that you enjoy the drive - it's part of the adventure. Many thanks to the owner for a most pleasant experience. Wonderful! We had a wonderful time visiting Jackson Hole. I hope to return. Actually, I could see myself buying property in the area... The house was lovely - very comfortable and well furnished. The views of the Tetons are spectacular. There is a "back road" to Jackson Hole Mountain Resort that is scenic and takes about 25 minutes.